Videos are not hosted on u2songs.com, if you find a broken link, or a video unavailable in your region, please report it to us. This video for “Hold Me, Thrill Me, Kiss Me, Kill Me” was a traditionally animated video, done by a team of 72 animators working over 11 days. This version of the video was the originally presented video which at one point has a sign that read “Mister Pussey’s” in the video (at 1:30) in the video above which had to be removed for the other version of this video. 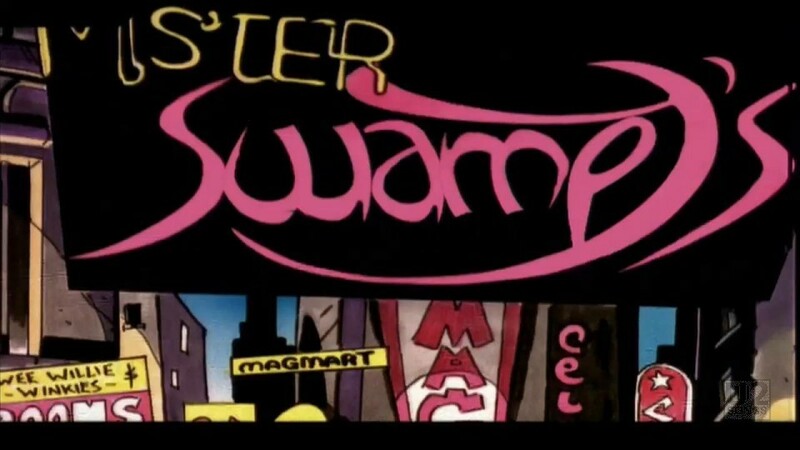 The original version with the Mr. Pussey’s sign can be seen in the video linked above, however it is the version with Mr. Swampey’s that has been released on the home video “The Best of 1990 – 2000”. 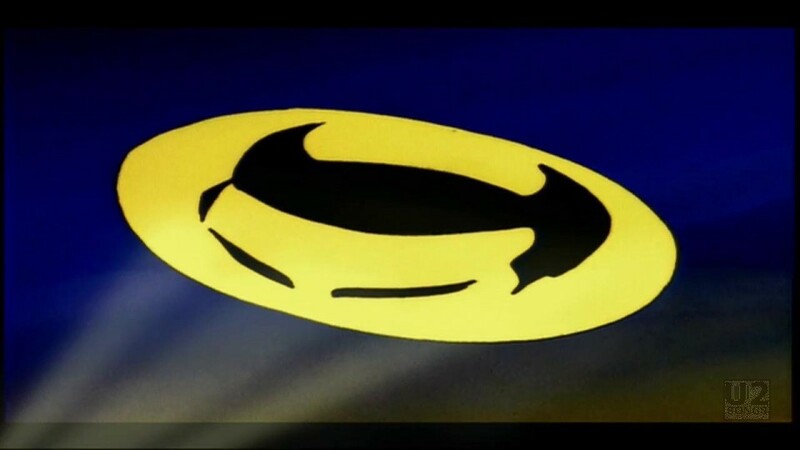 The video itself depicts two super-powered animated characters battling throughout a city. 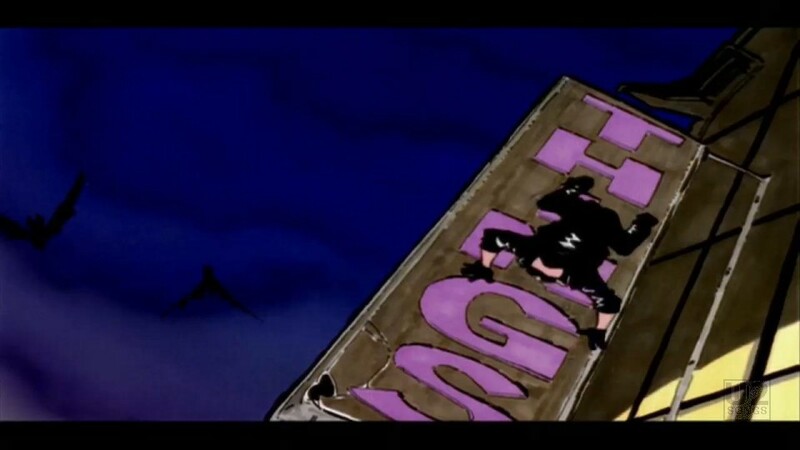 We also see U2 performing on an animated Zoo TV stage on a rooftop in Gotham City (complete with an animated “Riddler” running around). 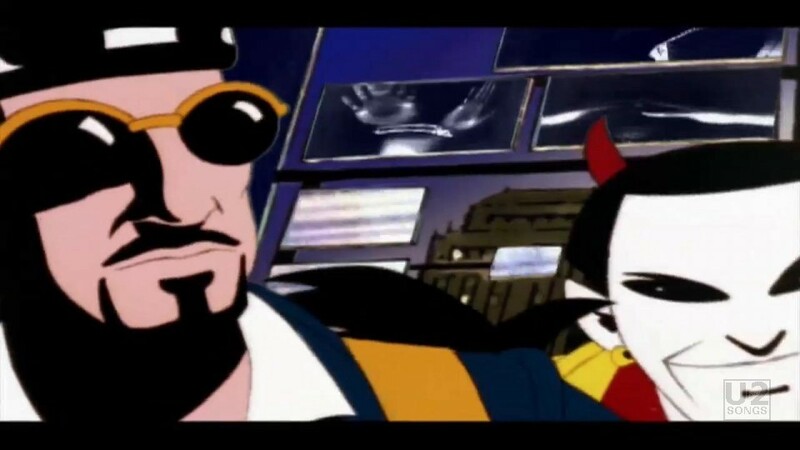 Batman and Robin also make appearances, but most of the animated footage is of “The Fly” and “Macphisto,” two onstage personas Bono had created for The ZOO TV Tour. In the video, “The Fly” starts out as a very angelic-looking Bono, complete with halo. He eventually turns in his halo for a pair of “Fly” sunglasses, which give him superpowers. We see him surprised by paparazzi at one point without his glasses, and he stumbles off the edge of a building. 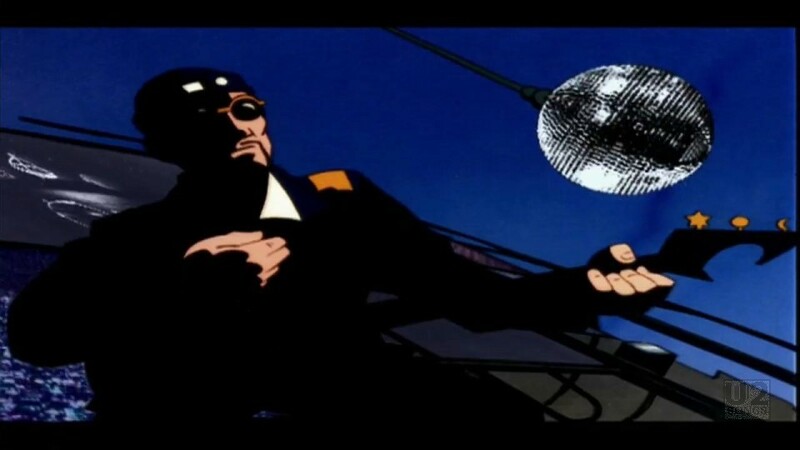 He is saved when an animated Adam Clayton tosses him his “Fly” shades, thus returning his super powers. “The Fly” also demonstrates some very Spiderman-like moves, including crawling down the front of a neon sign. 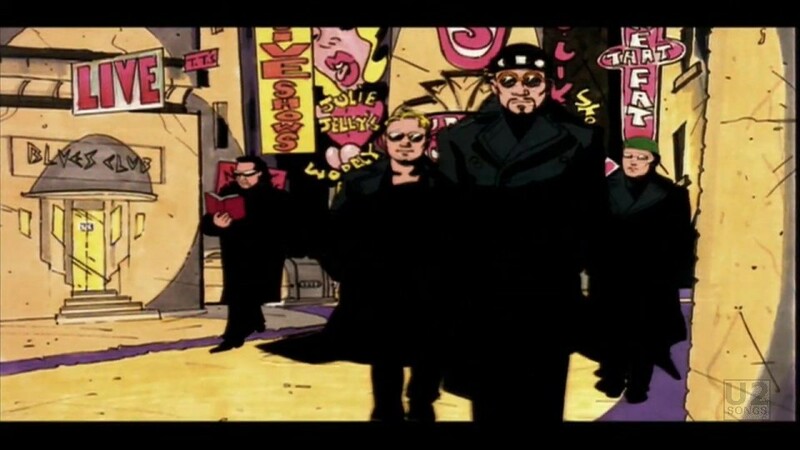 In a separate story line, Bono is shown walking down the street with U2 reading C.S. Lewis’ The Screwtape Letters, when he appears to be hit by a car driven by Elvis. We then see his body strapped to a hospital bed, where he dies. 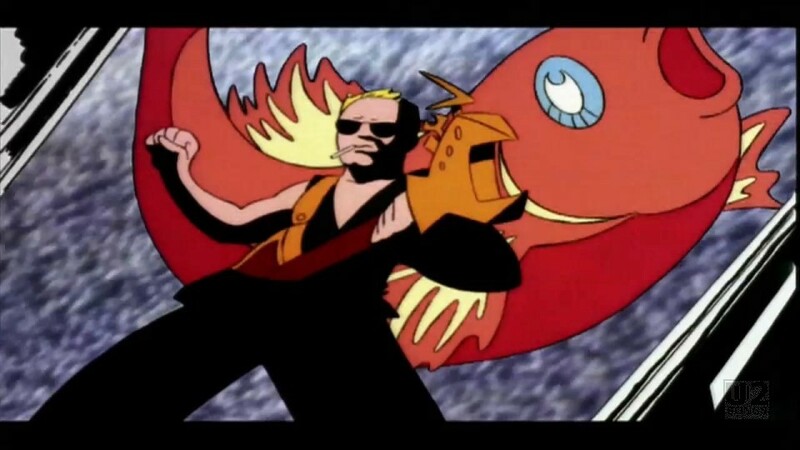 Suddenly, lightning strikes and Bono is transformed into “Macphisto.” His powers aren’t clear in the video, but he does have a rather cool winged car that he uses to chase the Bat Plane through the skies of Gotham. The animated Edge and Adam also have some fun shooting lasers out of their guitars at the Bat Plane as it flies overhead. Manga Studios which originally worked on the video has become TouchWood Animation. The original studio, Manga Entertainment Ltd, was created in 1991 under the umbrella of Chris Blackwell’s Island International Group. "U2 - “Hold Me, Thrill Me, Kiss Me, Kill Me” Single"
"U2 - “Hold Me, Thrill Me, Kiss Me, Kill Me” Promotional Release"
"Various Artists - “Batman Forever” Soundtrack"